Born Apr 3 181810,11,13,14,15,16 , Highland County, Ohio10,11,13,14,15,16. He married Teresa Wright1,7,13,16,18,19, Sep 11 18411,7,13,16,18,19 [Oct 11 184120], Clinton County, Ohio1,7,13,16,18,19. Teresa, daughter of David Wright & Teresa Mitchell2,10,17, was born Sep 12 18252,10,17 [Aug 23 182420,21], Clinton County, Ohio2,10,17. Note that John's brother Timothy married Sarah Jane Wright. The relationship between Teresa and Sarah Jane is not known (sisters??). John Hinchaw, age 30, born in Ohio; farmer; $1000 real estate. Terica Hinchaw, age 26, born in Ohio. Margaret A. Hinchaw, age 8, born in Indiana; attended school. Terica Hinchaw, age 5, born in Indiana; attended school. Mary E. Hinchaw, age 3, born in Indiana. John Hinshaw, age 42, born in Ohio; farmer; $7000 real estate; $1400 personal property. Terissa Hinshaw, age 36, born in Ohio. Margaret Hinshaw, age 17, born in Indiana; attended school. Terissa J Hinshaw, age 15, born in Indiana; attended school. Mary E. Hinshaw, age 13, born in Indiana; attended school. Sarah E Hinshaw, age 8, born in Indiana; attended school. Delila A Hinshaw, age 3, born in Indiana. Julia A Hinshaw, age 1, born in Indiana. Hinshaw, John, age 52, born in Ohio; farmer; $7500 real estate; $700 personal property. Hinshaw, Theresa, age 46, born in Ohio; keeps house. Hinshaw, Sarah E., age 16, born in Indiana; attended school. Hinshaw, Lorinda A., age 13, born in Indiana; attended school. Hinshaw, Delila A., age 11, born in Indiana; attended school. Hinshaw, William M., age 5, born in Indiana. Locke, Samuel, age 24, born in Indiana; works on farm. Hinshaw, John, age 61, born in Ohio; parents born in North Carolina; farmer. Hinshaw, Teresa, wife, age 55, born in Ohio; father born in Virginia; mother born in Kentucky; keeping house. Hinshaw, Delila, daughter, age 21, born in Indiana; parents born in Ohio. Hinshaw, William, son, age 14, born in Indiana; parents born in Ohio; works on farm; attended school. Baxter, Oliver, grandson, age 15, born in Indiana; parents born in Indiana; works on farm; attended school. Teresa died Mar 21 188317 [Mar 2 18838,20]; age 52Y 5M 3D17. HINSHAW Harriett M. (Frazier), dt/o Elijah and Joannah (Ellis) Frazier b. May 19, 1850 - d. Apr. 14, 1892 ae 41y 10m 25d. She m. Henry H. Miller Aug. 6, 1865, he d. Mar. 26, 1870 they had 6 children. She m. John Hinshaw June 23,188_ and had 2 children the youngest died Jan. 2, 1891. A mem. of the Christian Church. Surv. are the husband and 4 children, father, mother. 1 bro. and 1 sis. Fun. at Mt. Pleasant by Ira Johnson. (Death Rec. died of Ulceration of the stomach). 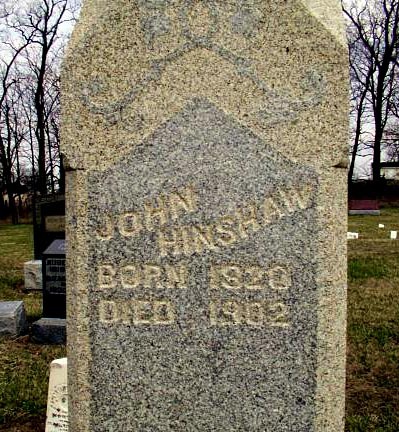 Hinshaw, John, head-of-household, age 82, born Apr 1818 in Ohio; parents born in North Carolina; married 42 years; occupation: farmer; owned farm (free). 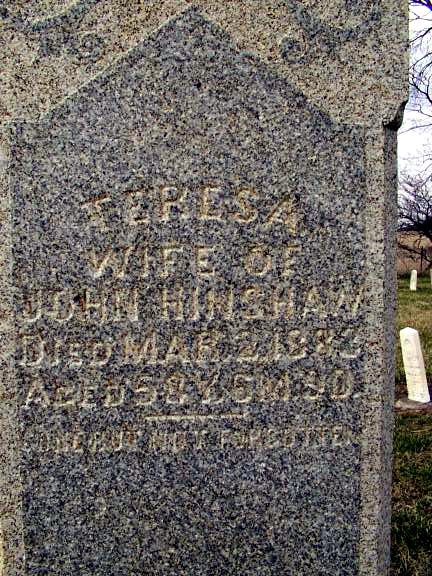 Hinshaw, Martha, wife, age 62, born Apr 1838 in Ireland; parents born in Ireland; immigrated 1876, U.S. resident 24 years; married 42 years; 6 children, 4 living. Hinshaw, Edith K., daughter, age 12, born Nov 1887 in Indiana; father born in Ohio; mother born in Indiana; attended school 6 months. Rankins, John A., step-son, age 34, born Jan 1866 in Ireland; parents born in Ireland; divorced; occupation: farmer. St. Clair, Ellenor, cousin, age 73, born Jan 1827 in Ohio; parents born in North Carolina; divorced; 11 children, 9 living. Hinshaw, Martha, head-of-household, age 72, born in Ireland; parents born in Ireland; widow; occupation: none, own income; owned home (free). Rankin, John A., son, age 44, born in Ireland; parents born in Ireland; widower; occupation: painter, house. Rankin, Lillian, granddaughter, age 20, born in Indiana; parents born in Ireland. 1850 census, Washington Township, Randolph County, Indiana; roll 168, pg 44, household #51. Contribution from () citing: Hinshaw family bible. 1880 census, Washington Township, Randolph County, Indiana; roll T9-0307, ED 173, page 268C, line #34, dwelling #83, family #83.
brought to a Hinshaw family reunion in the late 1980s. Gravestones of John & Teresa Hinshaw, Snow Hill Cemetery, Indiana. Clinton County, Ohio, courthouse marriage records. 1860 census, Washington Township, Randolph County, Indiana; pg 728, line #15, dwelling #252, family #246. 1870 census, Winchester P.O., Washington Township, Randolph County, Indiana; page 444B, line #1, dwelling #101, family #101. 1880 census, Washington Township, Randolph County, Indiana; roll T9-0307, ED 173, page 268C, line #39, dwelling #84, family #84. 1880 census, Washington Township, Randolph County, Indiana; roll T9-0307, ED 173, page 268C, line #42, dwelling #85, family #85. 1880 census, Washington Township, Randolph County, Indiana; roll T9-0307, ED 173, page 268C, line #46, dwelling #86, family #86. 1880 census, Washington Township, Randolph County, Indiana; roll T9-0307, ED 173, page 268C, line #1, dwelling #78, family #78. 1910 census, Washington Township, Randolph County, Indiana; roll T624-376, ED 142, page 164A, line #1, dwelling #45, family #45. Contribution from great-granddaughter Nina Rittenhouse ().